Fintry Guild organised a festival in December 2012, so when they offered to lend us their 13 trees we jumped at it, as it seemed such a nice thing to do; a real community effort. In August a small committee was formed, and, on and off, it took the rest of the year to organise. We contacted every local group to see if they would like to take part, hoping not to omit anyone. Overwhelmingly, people were keen to do so. We asked them to decorate the tree to illustrate their activity or to have a theme. 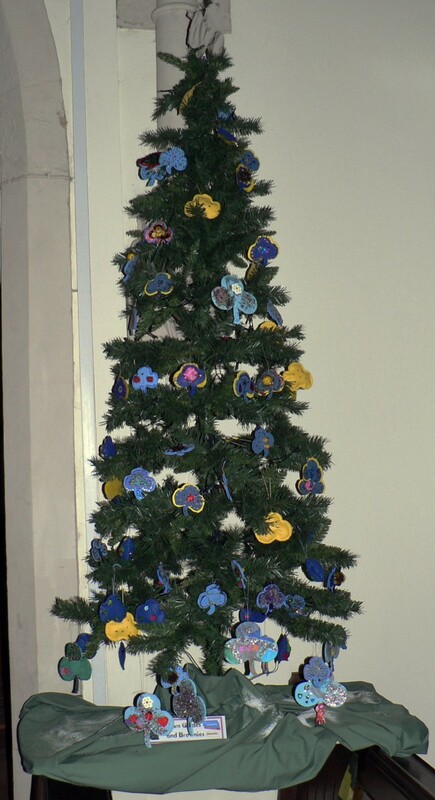 We managed to expand the trees from 13 to 21, so although some organisations had to share, for example, the sports clubs and Kirk youth groups, most groups had their own tree. It was great to see the diversity of decoration; people had put a lot of effort into it. Particularly pleasing was the memory tree in the foyer on which people could place the name of someone they wished to remember. Officially it ran for four days, opening with a concert by P6 and P7 Killearn Primary School pupils and closing with a concert by the Killearn Kirk Praise Group. Also during this period, groups of very young children from the nurseries came in and sang carols. The trees remained in the church for the whole Christmas period which added sparkle to the season. It was a very worthwhile and enjoyable event; many thanks to everyone who helped in any way. Thanks are also due to Blane Valley Construction who donated the boards which supported the trees across the pews. Although the event was never intended to be a fundraiser, we did have a donation plate which raised £145 for Crossroads Care.